With four of the G8 nations calling Europe their home, and an unofficial “ninth member” representing the entire continent, much of May’s G8 summit at Camp David could be Eurocentric. DePaul University political science professor Erik Tillman has been keeping an eye on Europe’s potential role in the meetings. Tillman specializes in Western European politics and the European Union (EU), and also public opinion and voting behavior in that region of the world. Tillman earned a PhD in political science from Emory University, wrote six peer-reviewed articles, conducted dozens of professional presentations, and has won a number of awards and fellowships. He also is working on a book: Politicizing Europe, which explores how European integration is changing elections and party politics at the national level. The project, though, is “still ongoing,” Tillman said with a laugh. For now, Tillman is focused on Europe and the G8 summit. He discussed what might happen at the G8 summit. Q: How does the European Union work within the G8 summit? They are the “ninth member,” but they don’t get to vote. How does that work? A: Basically, every year the G8 invites various observers or groups to come around and to participate in the talks. They get to be involved in some of the discussions, but as you say they don’t get to actually vote. That’s the case with the European Union. They get to be involved in the discussions and have their input, but ultimately, whatever final decisions are taken are along the actual eight members. Q: Is that at all problematic for the European Union? A: The big problem that kind of permeates everything is with the European Union is that it is ultimately composed of 27 different member states. They vary widely in terms of their role in the world, or their interests or level of development. At one end, you have countries like Germany, France and Britain, which are leading economic powers in the world. In the case of Britain and France, these are former colonial powers that have military interests and the like. At the other end of the spectrum, you have these really small countries, Scandinavian countries or Belgium or Luxembourg, or you have these post-communist countries. Their concerns are very different. The problem that the European Union always faces is: How does any representative from the European Union speak effectively for such a diverse group of states? They have very different preferences. What the EU representatives will try to do is they will try to strike that balance between speaking for everybody and speaking for the interests for the European Union as a whole. They are careful to not be a sort of a mouthpiece for the biggest countries. Q: Do any European countries have any unique or specific agendas to push at the G8 Summit? A: Each country tends to have its own slightly different set of political interests. The UK, in many respects, its attitude towards economic policy, international trade and the likes tends in some ways to be more similar to that of the US. It tends to generally be more likely to promote free trade, limit the regulation of any international finance, while France and Germany and some of the countries of continental Europe tend to be more likely to push for more of a stricter regulatory environment. The French and the Germans, for example, have been calling for a financial transactions tax, essentially a tax upon such activities like the buying and selling of stocks and derivatives and all these different financial instruments. The British are generally opposed. That would be one example of how you see these different partner countries in the European Union disagreeing with one another. Q: Will Greece’s debt crisis, or the US National Debt, or any other country’s financial problems be brought up at the Summit? A: It is quite possible that the ongoing Eurozone sovereign debt crisis would, because that’s something that certainly involves the four other European countries. Certainly the degree to which it influences the French and Germans and British, and it does the Americans as well. American banks had investments in Spain, Portugal and Greece. We’re certainly not entirely immune to it, and both the direct effects it would have on some of our banks, as well as for the fact that if the Eurozone goes into this big economic crisis, it will affect us due to our financial and trade ties. We have a shared interest in trying to continue to work on it. Q: Will Africa will be one of the biggest issues in the G8? A: [They will discuss] strategies of supporting development, so they’ll be particularly focused on things like infrastructure and trying to promote African economic development, which, of course, helps to alleviate poverty and disease, and raises the living standards of people throughout the African continent. Q: What will be discussed about aviation emissions? A: It’s a growing concern, of course, because airplane emissions are one of the things that contribute to greenhouse gas. As more and more people fly, and as airline industries are growing massively, it does become a growing concern about trying to limit that source of emissions. You see the European Union as taking a role in this, and various European countries are pushing for limitations on emissions. It’s a source of tension between the Europeans and Chinese, and this is something you’ll see them talk about at the G8. Q: Groups have been pushing President Obama to find political will to end world hunger. In what ways could the G8 nations attempt that, and is this something that will be discussed at the Summit? A: Things like this where you get into these issues involving the developing world, the poorest countries in the world, this one of those areas where the G8 can get criticized a bit. The problem here, in a sense of the G8, is, maybe with the exception of Russia, seven very wealthy economies. One of the concerns about the G8 is it could look a bit like of rich, Western countries sitting around and talking about what to do about Sub-Saharan Africa. Representatives of international aid groups or of the African countries will say, “Where is our input? Shouldn’t we be involved in decision making?” It’s a thorny situation. Certainly tackling issues of world hunger is valuable concern, but in these areas the members of the G8 can open themselves up to the perception that they’re speaking more for their interests and their pushing solutions that might benefit their own economies, and they’re not consulting the presumed target of who they’re talking about. Q: What are some reasons why people are going to protest? A: In the case of when the G8 was going to be here in Chicago [before moving to Camp David], you had concurrently the NATO Summit. You also get a situation in which it may no longer specifically be about what the NATO/G8 itself is doing. You get protests directed at the governments of the countries involved and what they’re doing. In the case of the United States, you can imagine protests about our continued participation in Afghanistan, about Guantanamo, about US foreign policy in general, or US economic policy in general. And it’s the same thing for the other participating countries. It may not be anything that’s specific to what the G8 does or what the G8 going to be considering in that year’s meetings, but there just aren’t that many venues where you’ll get these leaders of all these different countries in one place where you can kind of have your say and direct your say at them. Q: Is the relevance of the G8 in decline with countries like China and Brazil having better and larger economies than some of the G8 nations? A: It’s one of these debatable topics because you have groups like the G20, which include a larger sampling of countries, and you have the recognition of this fact when you see this invitation of the so-called “G8 plus 5,” that includes countries like China and India. 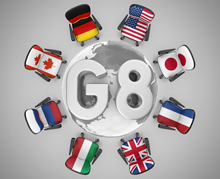 The G8 was created in the 1970s during a different geopolitical climate, during the Cold War when China was still a very closed economy, much less developed than it is today. It is a very valid question. But of course, as it is, the G8 still represents a big chunk of the world economies, and some of the biggest countries.